Older Australians may fondly remember a time when every house in town seemed to have either a dusty Holden Commodore or a well-used Ford Falcon sitting on the driveway, but as our country changes, so does our taste in vehicles. Take a (back) seat as we take a look at the most popular cars in Australia. If you were to take a time machine back to 1982, for example, you’d find that the five top-selling cars were the Ford Falcon, Holden Commodore, Mitsubishi Sigma, Ford Laser and Nissan Skyline. 1982 was the first year that the Ford Falcon finally (after 22 years) knocked Holden off its perch as the go-to car brand in Australia. Those two brands had a quarter of the Aussie new-car market sewn up back then but changes were on the way with new players surging into the mix – especially Toyota and Hyundai. When Alan Bond introduced Hyundais to the Aussie car market in 1986, most motoring writers were unimpressed, with one proclaiming that the Korean brand ‘poses very little threat to any existing cars because, at this early stage, there is very little incentive to buy except, perhaps, curiosity value’. Five years later, Hyundai had moved up to 10th position. By mid-2015, the Hyundai i30 was the top-selling vehicle in the country. One of the biggest changes in the Australian car market in the past few decades is the increasing influence of women as car buyers. Back in the 1980s, Ford took the radical step of creating a car aimed specifically at Australian women. Research shows that women today are involved in 82% of all car purchase decisions and drive 45% of all new cars on Aussie roads. It was called the Laser (Carla Zampatti edition) and it came with a special floor covering designed to reduce scuffs on high-heeled shoes, a distinctive colour and even a dedicated ‘handbag hook’ on the dash (they threw in a handbag too). The concept didn’t take off. But the world is different now. Research shows that women today are involved in 82% of all car purchase decisions and drive 45% of all new cars on Aussie roads. In 47% of car purchases, they’re making their own choices and they also participate in another 35% of joint car buying decisions. 68% of them say they ‘couldn’t survive without their car’. A new study conducted by Ipsos and Carsales.com.au found that most Australians use comparison websites and online car reviews as their main sources of influence and information when buying a new car these days. It also found that in an increasingly fragmented market, brand loyalty was decreasing even while car ownership and affordability were rising. According to Carsales, Australia’s new car market is one of the most competitive on earth, with 450 different models to choose from. The digital revolution has made consumers more knowledgeable, with instant access to statistics, reviews, technical details, mileage specifics and side-by-side comparisons at their fingertips. The study found that around 30% of new car buyers had also considered buying a used car – and vice versa. Australian car buyers make an average of four trips to a car dealer (either the same dealer or different ones) before buying a car, and mobiles and tablets are frequently used in the buying process – often while the buyer is standing in the showroom. A third of surveyed buyers also said they would be willing to travel more than 80kms to get a good deal on a new car. Australia has one of the world’s highest per-capita car ownership rates in the world, with new car purchases influenced by practical, emotional, lifestyle and financial considerations. Over the course of the entire purchase journey, 61% of car buyers (both new and used) were influenced by car comparison and car review websites, 45% were influenced by car manufacturer sites and 38% were influenced by their visits to dealerships. For the third year in a row, the Toyota HiLux tops the charts as Australia’s most popular car. Now into its eighth-generation, the Toyota HiLux has developed a well-earned reputation as one of Australia’s toughest and most reliable dual cab utes. How has it earned this reputation? Well, let’s start with the obvious. The HiLux blends a comfortable suspension setup with a standout, refined 2.8L engine that never feels overwhelmed, no matter what you throw at it. Elsewhere, the HiLux also offers precise steering, as well as a sleek interior that truly has all the trimmings, plus an excellent safety record, highlighted by ISOFIX anchor points. Pair this with an easy-to-use touchscreen entertainment system and it’s easy to see why the HiLux is Australia’s most popular car, notching up 5,300 more sales than it did in 2017. Another high-quality dual cab ute comes in at #2, making it obvious where Australian car buyers’ preferences currently lie. Combining good looks, a great driving experience, and an impressive set of features, it’s no secret why the Ford Ranger is one of Australia’s most popular cars. Enhancing this popularity, the Ford Ranger was successfully refreshed throughout 2018, adding an impressive ‘Panther’ 2.0-litre twin-turbo diesel engine. 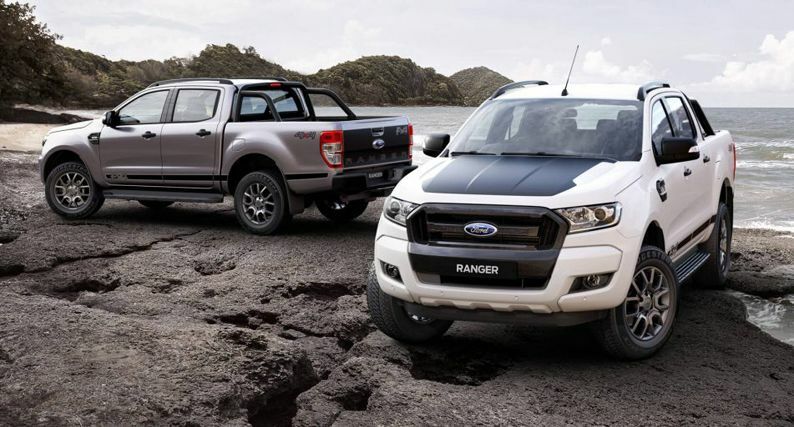 Some of the Ranger’s flashier features include adaptive cruise control, lane departure warning, and lane-keep assist. Add to this an insanely smooth driving experience no matter the terrain, plus a well-designed cabin featuring a state of the art infotainment system, and it’s no surprise that the Ford Ranger is one of Australia’s most popular dual cab utes. Australia’s most popular car in years gone by, the Toyota Corolla has lost some ground to the Toyota HiLux and Ford Ranger in recent years, but still remains a popular, reliable favourite for many Aussie drivers. The Corolla has stood the test of time for a reason: it is a good, practical car, which boasts a great track record for reliability, and solid fuel economy. Plus, the Corolla is affordable to own and easy to maintain. The Corolla’s 2018 version is pretty stylish, with plenty of legroom and interior space. The Corolla also has a high safety rating with standard features including pedestrian detection, touch-screen display, adaptive cruise control and automatic braking technology. Coming in at #4 is another dual cab ute. The Mitsubishi Triton made massive strides in 2018, moving from Australia’s 10th most popular car in 2017 to crack the top 5 in 2018. A workhorse in every sense, the Mitsubishi Triton has helped Australians get the hard jobs done for over 30 years. At first, you might suspect that the Triton’s quiet cabin is the result of an underpowered engine. But don’t be fooled, as the Triton offers the best of both worlds: a refined, quiet ride and a powerful, hard-working engine. Slip from behind the wheel into the back seat and you’ll discover there’s plenty of room, making the Triton an ideal option for taller passengers. The Triton also excels in terms of safety, coming equipped with active stability and traction control, and earning itself a five star ANCAP safety rating. Engineered to deliver power, performance, towing and technology, the Triton faces any challenge with ease, both on and off road – an impressive feat for an impressive car. A win for the small car market among a ton of high-selling utes, the Hyundai i30 more than holds its own as one of Australia’s most popular cars. As the winner of Australia’s Best Car award six times, the i30 has proven itself to be an honest, reliable small car that consistently gets the job done. The Hyundai i30 comes equipped with a cascading front grille, full LED front lighting, panoramic glass sunroof and twin tip exhaust, while the sporty interior includes steering wheel mounted controls. The Korean-made i30 has made impressive inroads into the Australian car market, and 2018 was no exception, with the i30 selling upwards of 25,000 units. The first of two Mazda manufactured vehicles to make the list of Australia’s most popular cars in 2018, the Mazda 3 has been an Aussie favourite for several years now. It is sporty, reliable and comes as a sedan or hatchback. When stacked up against its close competitors, the Mazda 3 fares well. Among compact cars, the Mazda 3 sets the benchmark for road handling, with precise steering and a nice, tight turning radius. Another entrant from Mazda, the CX-5 is right up there with the very best when it comes to medium-sized SUVs. In fact, the Mazda CX-5 has been Australia’s best-selling medium-sized SUV every year since 20122. And it’s easy to see why, as the CX-5 offers a practical interior design that’s more spacious than it might appear from the outside. Elsewhere, the fuel economy is excellent while the on-road performance is impressive. Every model in the range comes with a comprehensive array of safety features, including Dynamic Stability Control, ABS Brakes, 6 airbags, Emergency Brake Assist and Electronic Brake Force Distribution. If you like plenty of space, the CX-5 answers the call, with fold-down seats, a large boot opening, and a low lift gate. One of two new entrants onto the list of Australia’s most popular cars in 2018, the Nissan X-Trail blazes a trail all of its own. A solid, reliable mid-sized SUV, the Nissan X-Trail more than justifies its place among Australia’s most popular cars, thanks largely to its excellent value for money and impressive off-road capabilities compared to its mid-sized competitors. Combine this with a roomy, stylish interior, admirable fuel economy, and a good safety record, and the Nissan X-Trail is a great family car, with a little extra x-factor. Another new entrant onto the list of Australia’s most popular cars in 2018, the Toyota RAV4 is a powerful, polished SUV, which has more than earned its popularity. The RAV4 also marks Toyota’s third entrant on this list, meaning Toyota continues to be Australia’s top-selling car brand, with 217,061 new car sales in 2018 – an increase of 0.2% from 2017. Back to the RAV4, buyers have every right to be flocking to it in their droves, given its sleek exterior design, outstanding handling, and top-class safety record. Fans of the RAV4 for are in for more good news in 2019, too, with the 2019 RAV4 update set to become Toyota’s first hybrid SUV in Australia. While the Hyundai Tucson has dropped a few spots – from 7th last year to 10th in 2018 – it still had a mighty impressive year. The Hyundai Tucson has everything you would expect from a high quality medium-sized SUV – comfort, safety, an eye catching design, and a long list of features. However, what really sets it apart is its on-road performance, offering a smooth, comfortable ride, highlighted by top-notch suspension, a refined engine, and reliable steering. In terms of safety, the Tucson is also a winner, delivering six airbags (including dual front airbags), as well as front-side and full-length curtain airbags, and electronic stability control. Pair this with an extremely spacious boot and ISOFIX anchor points, and the Hyundai Tucson is sure to appeal to parents.